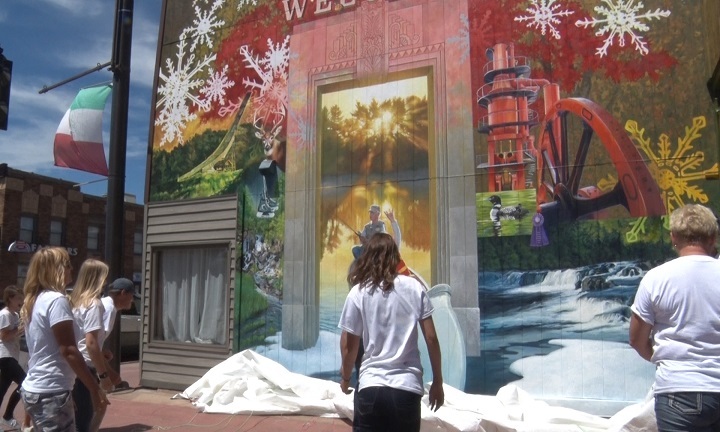 IRON MOUNTAIN — A new unveiling for a welcome mural through the power of words project happened today in Iron Mountain. The Iron Mountain Downtown Development Authority (DDA) and the Svelata Foundation invited the community today to join them in the unveiling of the newest mural of the Power of Words Project. These projects were all done in the downtown area of Iron Mountain on the walls of a few local businesses. These artists put their hearts into their craft and worked long and hard hours to complete all three murals in four weeks. As you can see the finished product is breath taking. These murals were also helped out by students who received scholarships from the Svetlata foundation to come and intern under Mia. But some young students also came to just be a part of the project itself. Mia is always looking for more help on future projects as well. Later this week Mia Tavonatti will be heading out of Iron Mountain. She will be heading right to Manistique where she will be working on her next big project. Elephant art: Is it real?